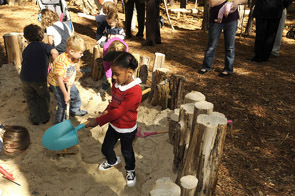 Want a playground made of all-natural ingredients? 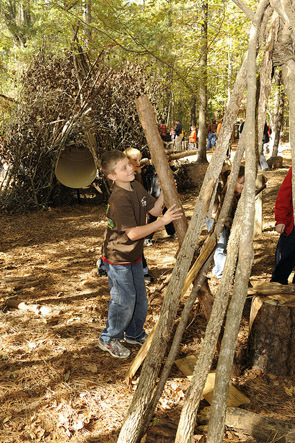 Look no further than Auburn University's new nature playground, which boasts an eagle's nest, tree house, beaver lodge, mole tunnel, sandpit, teepee, boulders, and logs. Unlike bright plastic monkey bars and slides, these play elements are camoflauged -- but children seem to have no problem finding them. 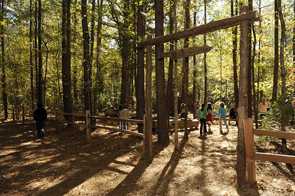 Jennifer Lolley, administrator of the Forest Ecology Preserve where the playground is located, says she hopes that it will become a "conduit" for families to explore the great outdoors. 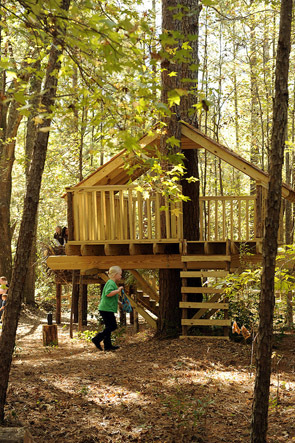 The playground represents an effort to combat "Nature Deficit Disorder" in an era where children ages 8 to 12 spend nearly 7.5 hours per day in front of a screen. Photos courtesy of Auburn University.